Gumbeaux Rouge is a Baton Rouge, Louisiana-based band performing South Louisiana favorites in a style commonly called “Swamp Pop.” The name Gumbeaux Rouge refers to the wide range in the types of music this band can play as they throw it all in the pot for their fans’ “Gumbeaux.” Add to it their red hot spicy style of seasoning in each song, and their ties to Louisiana’s Capitol City, the French word “Rouge” correctly labels this bands abilities. Most folks know something about gumbo, a dish that’s generally accepted as having originated in Louisiana but that has since become common in many other areas. Although it’s prepared in many different ways, it’s basically a thick soup or stew that contains a lot of ingredients native to an area. Using that as a starting point, if you were naming a new Baton Rouge-based Cajun band, one that combined many of the musical influences of the area kicked up with a little extra ‘red-hot sauce’, the band’s name would be a natural. 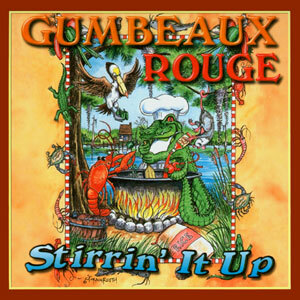 That exciting new group – Gumbeaux Rouge (red gumbo) – has now issued Stirrin’ It Up, their debut album on the Jin Records label. Headed up by veteran keyboardist and vocalist Mitch Landry, the six-member group (all of whom also sing) includes Barry Hebert on guitar and ‘Doc’ Chaney on sax and fiddle, along with guitarists Johnny Smith and Jerry Doucet, and finally drummer Chad Doucet. However, some of the originals might be a little closer to the band’s primary sound. Among the best of those is the rockabilly-styled “I’ve Done It Again,” with Landry doing the singing on his own composition, and the larrupin’ good time offered by the band on “Mama Mama Mama,” a piece that features Jerry Doucet on vocal. Good stuff and good fun, as is the entire mix of songs here. Try it!